How Do You Recognize Good Effort? One of my co-teachers, who I often refer to as “Follower 100,” and I have a very energetic, spirited class at the end of the day. Which, I should add, has 32 students, 24 of which are boys…. of 8th grade Language Arts…. and it’s right after lunch. It makes me tired just typing it. Each day we find ourselves trying new strategies, often accidentally, to help manage and engage this class and accomplish as much as possible. This is no easy task, as you can imagine. With the dynamics of this class we have to strategically arrange the seating chart (not easy), plan our cooperative learning groups/islands very carefully, and offer encouragement and praise in unique ways and for some things that may seem trivial or inconsequential. You can’t call them “kids or children” to their face…even though they are…because they get offended. You hesitate to call them “young adults”…because at 13 and 14, they’ll let it go to their heads. You can’t joke around too much, because they cross the line way too easily. You can use words like “old fuddy-duddy” in class, because it makes them laugh. You can put scratch and sniff stickers or any popular character sticker on their papers with no complaints. A friend of mine specifically gives “girl” stickers to the girls (like Strawberry Shortcake) and “boy” stickers to the boys (Transformers) and sometimes mixes it up…and the “kids” love it. 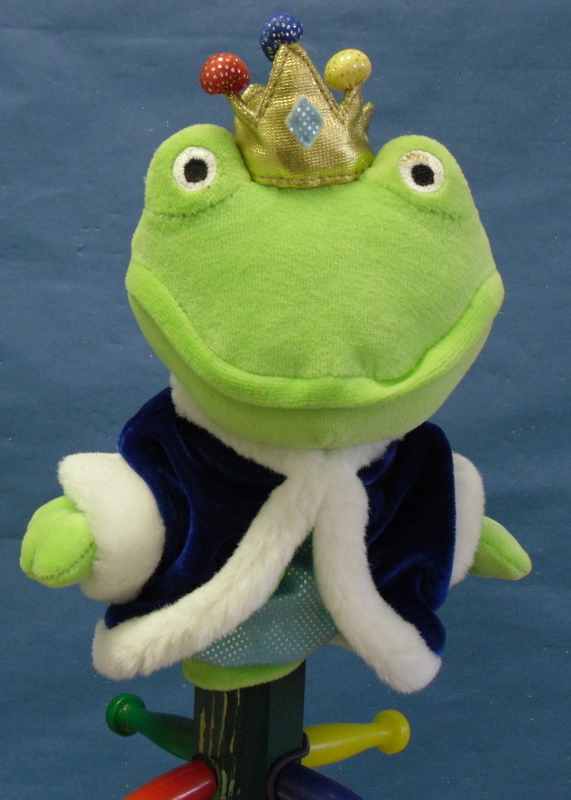 You can present a “King of English” award, in the form of a frog puppet, and they’ll eat it up. Yes, we have resorted to this in Block 3 of Language Arts. And as dumb as it sounds, it works. The students were not really working well in cooperative groups, but with a new block schedule, BYOT, and 84 minutes of Language Arts a day…group activities were necessary for their sanity and ours. We needed a way to keep them on-task, a way to motivate them to help those in their group who were having difficulty, and a way to have productive discussion and learning. And the idea was born….an award, a trophy-like award, that could be presented to the best island each day. So I raided Tweedle Dee’s old toy box when I got home and I found a few options: a Troll doll and our obvious choice….The King of English. On the first day of our presentation of this now coveted award, we presented it to a solid group who had probably worked the hardest of all the groups all year. They not only got the honor of holding/wearing the puppet, they also got to pick something from her candy jar. It was a little cheesy and kind of corny, but the next day….they were all vying for the title. It is not an award that can be given every day because some days we don’t have group work. We have one group of boys who constantly pushes and prompts each other so they can win. Follower 100 had a sub two days in a row a few weeks ago and apparently I was “playing favorites” when they received it two consecutive days. I then had to point out all the reasons why other tables did NOT receive it. I did not identify the offenders specifically, but I provided plenty of examples how NOT to win the King of English. The day we really knew it was something special and worth continuing? The day a boy whipped out his cell phone and had a friend take a picture of him with the King of English. You can bet that probably went up on Facebook after school. Everyone wants their 15 minutes of fame, or their chance to be the star in class. For many of the students in our class, they don’t get a lot of opportunities to be the star. If a little plush puppet works, then so be it.